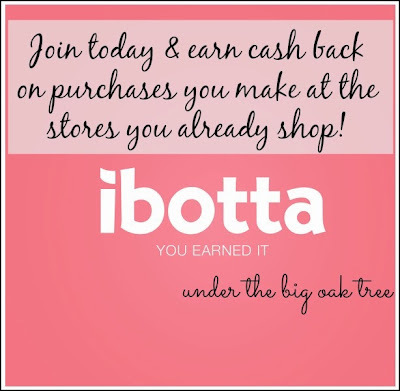 Under the Big Oak Tree: A Few Reasons You Should Join ibotta Now! You still haven't joined ibotta? I just want to share a few reasons on why you should! Today, I transferred over $30 into my paypal account. $30 that I can put toward some Christmas shopping! Money I earned through ibotta making purchases in the stores I normally shop (including home improvement stores and pet supply stores) for items I planned on buying anyway! On Black Friday, I sent Joe out to Lowe's for a string of Christmas lights that they had on sale for $1.99 since I knew that ibotta had a $1 offer for Lowe's on a purchase of Christmas lights! So, in the end that string of lights cost us just 99 cents! That ibotta offer is no longer available, but there are so many other offers going on right now! Also, there are a bunch of different cash out options when you are ready. You can purchase gift cards for Starbucks, Redbox, iTunes, and even Regal movie theaters! Sign up now and start earning cash back on your purchase and referrals!